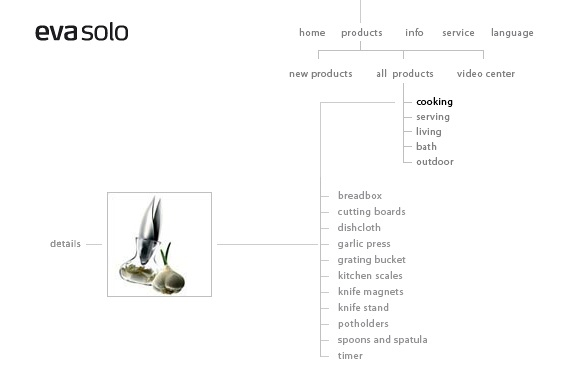 Clever use of tree layout to showcase their products, tree allow us to see where we are and where we’ve been. I like the fact that the tree is quite minimal allowing the products to be your main focus. It’s so tempting to use flash, I’m glad they didn’t. I have to admit that I was a big fan of flash based web sites but recently have gone off them speed being one of them, don’t get me wrong flash does have it’s benefits but should be used sparingly. An idea would be to utilise this concept to represent employees in an organisation, something I will definitely be using in my next app. Hey Dien, nice menu navigation control it does look very cool and eliminates the need for the old school. This tree style navigation definitely gives the site structure and a clean look. By the way it’s great too see you have started your blog. I search some keys such as tag, jquery and it bring me to site KM systems. Then this site has a link to you. Your nick name sound as you are a Vietnamese person? Nice to be your friend and have you a good time.